6 packs. America's No. 1 guacamole. 100 cal snack packs. 100% all natural ingredients (stuff you can pronounce) + 20 vitamins & minerals (stuff your body wants) + good fats (yes, good fats) + more potassium than a banana! We welcome your comments: eatwholly.com. How Do I Use Thee? Let me count the ways - mealtime, snacktime, anytime! 1. 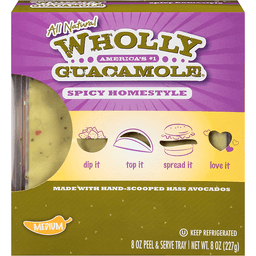 Quick grab 'n go packs - add a guacamole pack to your kid's lunchbox (voila - a healthy mini snack). 2. 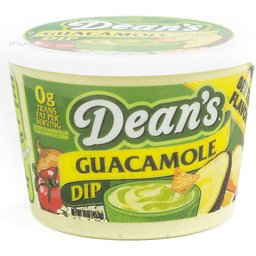 Pick-me up - add chips or dips in fresh veggies for a late afternoon snack! 3. Toppings - top a burger or chicken sandwich. 4. Be good to you! Life is about feeling good, inside and out - grab a 100-cal snack pack and go. Gluten free. Less waist, more taste! Our snack packs are guilt-free individual servings ready to grab n' go. 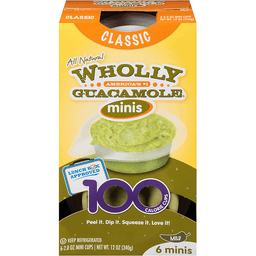 Perfect for lunch boxes or a quick snack and 100 calories! Please recycle. Product of Mexico.